The urban slang term ‘Coconut’ is used to describe black people who act “white” - it literally means black on the outside and white on the inside. The title sets the tone for this well written, easy to read book about two young girls growing up in the ‘new’ South Africa. It is really two separate stories, the one of Ofilwe who grew up white and the other of Fikile (or Fiks) who desperately wants to be white, and the struggles each of them have with the paths their lives have taken. Some scenes in the book are hard to swallow, not because they suspend belief, but because we never want to accept such situations, but they are dealt with so graciously and elegantly that one almost smiles through it. I try and make a point of reading ‘local’ literature as much as I can stomach, but as I prefer reading fiction, it doesn’t happen too often that I do pick up a locally published, South African-flavoured book. My mom bought my daughter a copy of Coconut at the recent Jozi Book fair, so I thought I would see what it was like, as it was in the house already, and I am quite pleased that I did pick it up. You can read an excerpt from the book here, but I would recommend reading the entire book instead. It sounds really, really good! I prefer non-fiction to fiction to be hionest but reading only non-fiction sends me into quite a quagmire of despair. So I read more fiction than non-fiction and that is why I mostly choose easy to read books, I guess. Oh look! 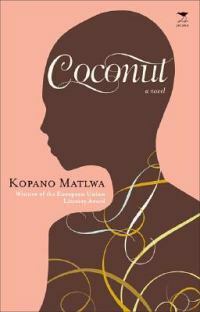 Coconut is available on Amazon: http://www.amazon.co.uk/Coconut-Kopano-Matlwa/dp/1770093362/ref=sr_1_4?ie=UTF8&s=books&qid=1256911630&sr=1-4. You should post your review there too - it has none! I read both fiction and non-fiction... I just love to read!